Solar panels work by allowing light into the solar cells. Due to the upwards angle of solar panels, they are more prone to bird droppings and a build-up of general dust and dirt that does not wash off with just rain. This reduces the amount of light hitting the panel and reduces its output. As the projected energy figures claimed by solar panel manufacturers and installers are based on the optimum performance of clean solar panels, this build-up of dirt can adversely affect Solar panel’s ability to meet those projections. Therefore it is important to clean solar panels in order to protect and maintain your investment. 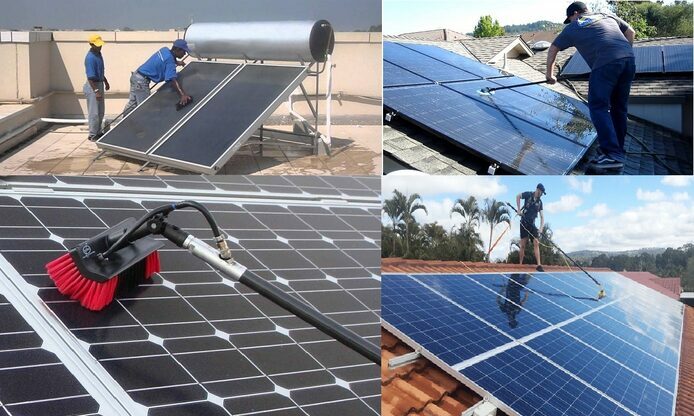 Regular solar panel cleaning will also help you to make the most of the Net Metering System. We Offer Professional Commercial Solar Panel Cleaning with Water/Cleaning Liquid followed by Wiping which helps in cleaning Solar Panels on Annual Maintenance Contract Basis. Cleaning of Solar Water Heaters will help in removal of Scale deposited inside Tank and Collectors. GET SOLAR is an authorized Dealer for Bosch Solar Panels and Bosch Solar Water Heater at Nashik. 10 KiloWatt OFF GRID Solar Panel Installation At School in Gangakhed, District Parbhani, Maharashtra, India. 40 KiloWatt Solar Panel Installation At MIDC Sinnar, Nashik Maharashtra by GET SOLAR Nashik. GET SOLAR is an authorized Dealer for Bosch Solar Panels and Bosch Solar Water Heater in Nashik.